I have just noticed and resolved an issue in my EM13c R2 AWR Warehouse environment that I brought upon myself, hence a blog post for any others who might run into this, which also seems like a good time to release the scripts I use to generate and populate Oracle wallets for my EM13c agents. I ran through many debugging steps: changing preferred credentials, bouncing the agents, checking for firewalls blocking connectivity, none seemed to help. 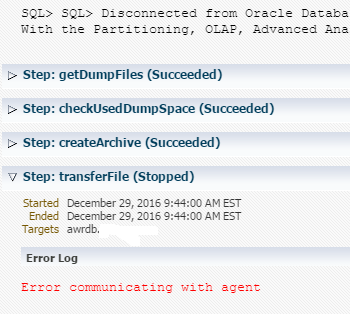 Eventually I realized the step I had missed in setting up the new managed server where the source database now runs: I had not generated an Oracle wallet for the agent on the new server, while I did have an Oracle wallet for the agent on the previous, now-retired server. This created an issue because I have secured the agent on my OMS host (where my AWRW repository database runs) with a custom third party certificate, and the new agent, lacking a wallet containing a trusted root certificate to which it could trace the repository agent’s certificate, could not initiate a connection from the AWRW source DB host agent to the AWRW repository DB host agent. I generated a wallet for the new agent, added the trusted root certificate and a certificate for the host to the wallet, stopped the agent, deployed the wallet, and started the agent. After those steps, running the AWRW load from this source database completed successfully. I believe that the missing trusted root certificate prevented the creation of a secure channel between the two agents. I probably did not need to add the host certificate to resolve this problem, but consider it a good practice anyway. If you read this far, you may find my create_agent_wallets.sh script useful to generate wallets and certificate signing requests for every agent in your environment. If you find the wallet creation script useful, you may also find my import_agent_wallets.sh script useful to populate those wallets with signed certificates received from your CA. This entry was posted in Cloud Control and tagged agent, AWRW, emcli on December 29, 2016 by Brian Pardy. Just a heads up, after upgrading the repository database from 12.1.0.1 to 12,2,0.1 we had some corruption in SYSMAN.MGMT_COLLECTIONS_E on both dev and prod. OEM version at 13.2.0.0.0. Support had us backup, drop, recreate, reinsert data on table and it fixed the issue. Thank you for the warning! I have not yet attempted to upgrade my repository database beyond 12.1.0.2 but I will keep an eye out for this when I do.